Customer Portal - where you can log in to create new support tickets with us or access all the precious tickets you've created so far. - If you haven't set up your customer account with us in the past, just click here, enter your name and email address. You will then receive an email with a link to create your customer account. - If you already have a customer account with us, click here to Sign In. 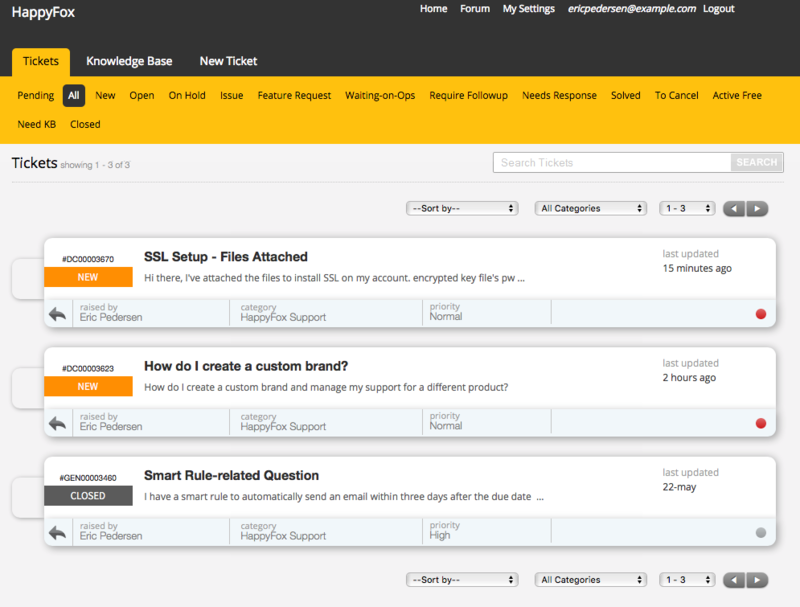 - Once you've signed in, you'll first see the list of tickets that you've previously created, appear under the Tickets tab. - Clicking on the Knowledge Base tab will you take you to the HappyFox Knowledge Base where you'll find our various sections and articles. - The New Ticket tab will you allow you to create tickets, through which you may reach out to us with your questions and concerns. Tickets you create from here are secure (over HTTPS), and will allow you to send us any files/attachments securely. Please note, when creating a ticket using this form, you may not receive an automated email confirming that your ticket was created. However, it will appear in the list of your New tickets, under the Tickets tab. Also, CC recipients added in the New Ticket form or while adding an update will not automatically receive an email from the helpdesk, but will be included in our subsequent responses to you. - The Home button on top, will take you to our Support Center's homepage. enable/disable the notification you receive when we reply to your email.